Set in a lost attic, full of creepy sounds, spiders and dripping candles, the theme certainly sets the tone for an above average Halloween slot. Mythic Maiden mobile slot is a deep, dark video slot that can certainly be enjoyed outside October 31st however. As a Net Entertainment slot it plays very well and has some unique features that make it stand out. We could be picky and say that the graphics aren’t as immersive as we’ve come to expect from the NetEnt Touch set of games. But that would be nitpicking. Ok, we will because we can… It just doesn’t feel as ‘finished’ or as slick as some of the other mobile slots we play regularly. You’ll find dripping candles shaped like the A, K, Q, J and 10 symbols, a shrunken head, a big tarantula, what looks like an apes skull and more as the symbols spin on the 5 reels. However, what you”ll really be hoping for is the moonlight in the broken window wild with a 3x multiplier, which doesn’t come as often as we like, but can bring decent rewards. As expected and as is usual, the free spin bonus feature is the real star of this Mythic Maiden mobile slot game, with the red and blue light scatter symbols triggering this feature. Though you start with 10 free spins, you often get a few more on top and random multipliers on wins. We hit the 10x multiplier which allowed us to walk away with 76x our bet once, and it made us very happy indeed. All in all, a very good and entertaining mobile video slot with a great jackpot amount of 75,000 coins and free spins feature. Below average for Net Entertainment, above average on most mobile video slots out there. Wild Symbol: The moonlight you can see piercing through the broken window is the wild symbol, which comes with a decent x3 multiplier. Scatter and Free Spins: Get three, four or five scatters and you’ll get a set of 10, 15 or 30 free spins, respectively. But this is where the Mythic Maiden comes into full force. Standing on the right hand side of the slot screen, the maiden wakes up during the free spins round, giving out random prizes per round. When the statue opens up, it churns out prizes from additional free spins to multipliers up to 10x. Possibly the only time you want a spooky iron maiden on your side. 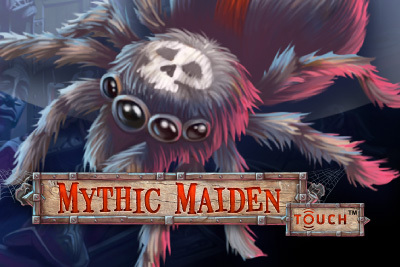 Mythic Maiden Touch mobile slot is a spooky Halloween slot that should be enjoyed all year round, and although it doesn’t quite match up to some of the other NetEnt slots, it’s still heads and tails above most of the mobile slot machines out there.